Becoming a mom was never a goal in my life. Motherhood just happened. One day we realized we were pregnant and that was it. I learned there was a tiny being growing inside me, not unlike an alien in some sci-fi horror movie, and at some point it would come out and make me a mother. A mother. You’re never prepared for that moment, even if you’ve been planning and trying for years. You look at your house differently; all of a sudden every corner becomes a potential threat for your unborn child. You look at yourself differently; are you eating enough iron? Are you getting enough rest? Becoming a mom changes you in more ways than you can imagine. Here are a few things I learned from having two children and my still-running stint with motherhood. There’s no right (or wrong) way to be a mother, as long as you love your child. 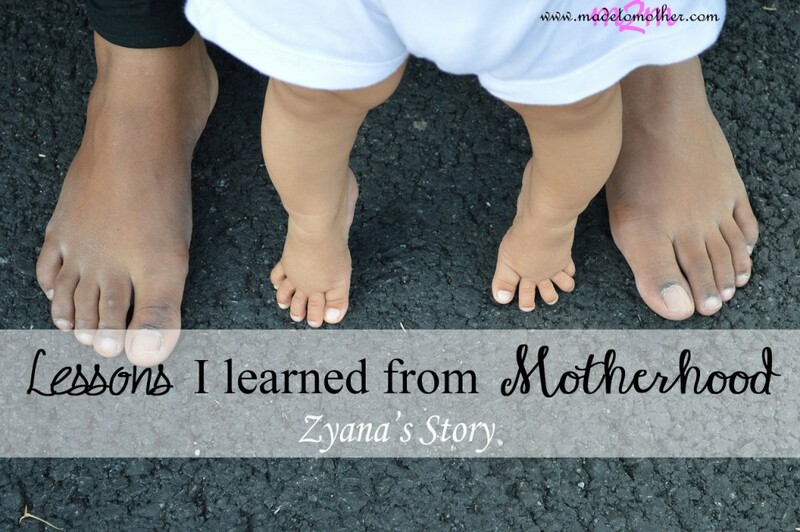 As a first time mother, I was bombarded with advice and suggestions from well-meaning people. Sadly, that advice was usually all over the place. If I was advised to exclusively breastfeed, I was also advised to give at least one bottle of formula a day. If somebody recommended sleep sharing, someone else told me horror stories of children refusing to sleep in their own beds later. For a first-time mother, so much information becomes exhausting and terrifying, but the truth is, children are strong, adaptable and forgiving little things. If you truly love your child, and are committed to his/her wellbeing, you’ll do fine whether you start feeding them solids at five months or six. Working mothers love their children as much as stay-at-home moms do. It’s a huge debate that usually ends with both parties sulkily accepting that there’s nothing they can say to convince the other, but as a woman who’s been both a working and stay-at-home mom, I can honestly tell you that the only thing that matters is the quality of the time you spend with your child, not the quantity. I’ve seen extremely dedicated working moms who take regular pumping breaks to ensure their child is exclusively breastfed even when they’re not around. But I’ve also seen stay-at-home moms who spend more time with their phones than their kids, so the example goes both ways. The only real solution to this debate is that mothers should do what makes them happy. A happy mother is a good mother. Appreciate the little things (like sleep and privacy). Oh, sleep… I can’t believe there was a time I actually thought you were a waste of time. I can’t believe there was a time I could sleep whenever or as long as I wanted to. In fact, I cannot remember a time in the last four years I was able to lock the room and sleep, or read, or play Candy Crush. Or simply lock the room for a minute. These are small things you’ll appreciate more after children; being able to sleep late on Sunday mornings, taking long baths, reading a book for hours on end, eating a meal in peace. Life with kids is usually chaotic and consuming, which is why my next point is extremely important. Appreciate the big things (like your partner, and your mom). If somebody is willing to stick with you and a screaming toddler during sleepless nights and impromptu visits to the emergency room, they deserve a round of applause. Or at least a kind word once in a while. It took me a long time, but I learned to thank my husband for doing what was essentially his job, and thank my mother for being around and helping even though it wasn’t essentially her job. It’s so easy to take people for granted, especially your partner, but they really are trying their best, as are you. Appreciate them more. Saying thank you is a cheap, but effective way of telling people you value them. Remember who you were, are, and plan to be. It’s so easy to forget yourself after you become a mother. In the beginning, you don’t have time to apply makeup before leaving the house because you have to pack for every emergency the baby might throw you in, or shower after every spit up that is more on you than the bib. Then you realize that people have stopped judging you because you’re a mom and moms are allowed to look a little frazzled. Gradually you become comfortable with yourself and your status as simply MOM. There’s nothing wrong with that, but as I realized while going through my college photos, I’m so much more than that. I’m still an individual with promise, and I have so much more to offer myself. I learned that motherhood doesn’t have to define me. Being a mother is only a part of who I am, not all of it. At some point your kids will grow up and not need you as much anymore; don’t wait for that time to look for yourself. Your children should know and respect who you are throughout their lives. Zyana Morris is a passionate blogger who loves to write on disciplines such as health care, parenting and lifestyle. She is featured author and staff writer at various blogs around.